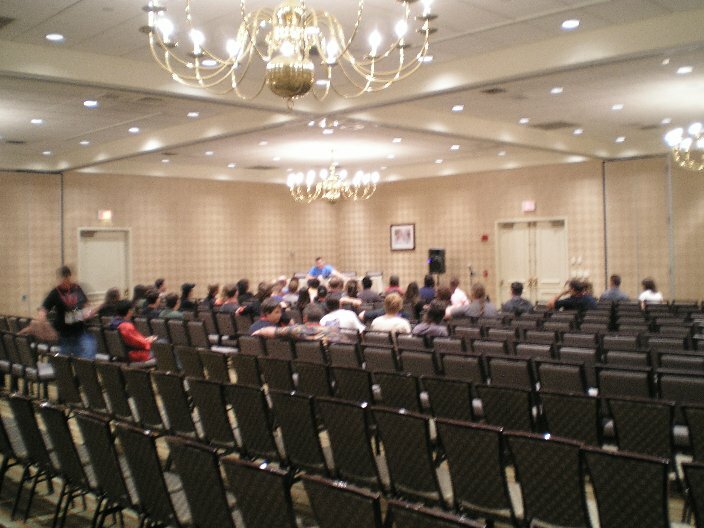 Above is the Friday session in the smaller panel room (Friday events were only open to pre-registrants, so only a smaller room was used that day). Below is a closeup of him at the Saturday panel. I might put in a scan of him later from the program guide, which shows a really old publicity photo of him when he was a lot younger. It was like, whoa, who's this guy - he looks nothing like the dude in the program guide. David Kaye has played Megatron almost continuously for the last ten years, but will now be Optimus in the new Animated Transformers cartoon at the end of this year. Being on the voice cast, he gave out a fair bit of detail on the characters and Voice Actors involved. He couldn't talk about the plot though, but did mention that it was set in Detroit. - There will be a 2-part movie in December (in America) and the cartoon starting from January. - Sue Blu (voiced Arcee in Gen1) is the Voice Director. - David also plays Grimlock and Lugnut (Megatron's stooge, like BW Inferno). - Series will be on Cartoon Network and is a whole new series/generation. 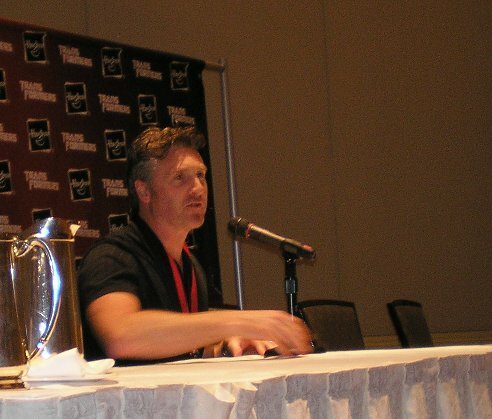 - Corey Burton (from Gen1) plays Megatron, Ratchet and Shockwave. - Tom Kenny (from Spongebob) plays Starscream. - Other characters mentioned were Mirage and Bumblebee. - Just finished up recording the second season of the cartoon this week (this series is probably voiced first, then animated, like Beast Wars). - Hinted that some Gen1 elements could resurface. Talked about Dubbing Vs pre-animated recording (Armada Vs Beast Wars). Also mentioned that he prefers playing bad guys because they have more depth. Mentioned that one character he really liked doing was Noble in Beast Machines. Pretty much everything else was either comments on something, was not Transformers related, or he was doing lines in one of his voices. I'll update this if I find a report elsewhere on the other two sessions.